Team Five gatecrashes the most exclusive gentlemen’s club in London, but for once no one’s batting an eyelash at pajama bottoms, stewardess uniforms or girls in non-Victorian trousers. The club members are equally oblivious to the fact that they’re being served by a waitstaff consisting entirely of Edwards. Meanwhile, the Red Queen lurks in the wainscoting. Despite the rather Lewis Carroll premise, this story plays out very much in the here-and-now of 19th century London. Snappy dialogue, secrets and secret rooms, period manners and decor, plenty of cliffhanger scenes that end with somebody in mortal danger, and moments of pathos and sympathy? Perfect. Plus, every companion does something useful at some point, the Doctor flashes his cricket skills, and there’s time enough for him and Tegan and Adric to snipe at one another while Nyssa attempts to moderate. This is the sort of thing Black Orchid tried to pull off, done rather better. Tegan: Doctor, you’re not our headmaster. Doctor: Well, sometimes you could all do with one. Even if Nyssa never wants to see the 19th century again by the end of it. I have some bad news for you, my dear, and his name is Brewster. Tegan snark is particularly good in this audio, by the way; writer Phil Mulryne took full advantage of Janet’s area of expertise. While the story gives all three companions chances to shine, this time it’s her turn (as The Star Men was Adric’s, more or less). As Janet has noted, Tegan is the one with the practical, hands-on skills that the brainiacs around her sometimes lack. Also, remember that I hinted that the crowded TARDIS felt a little out of joint in The Star Men? Well, they clicked together just fine in this outing. Barnaby Edwards proved years ago with Emerald Tiger that a four-person crew can work very well, given enough to do. This time he was directing instead of writing, but it had the same energy. The disadvantage of a crowded TARDIS that it’s harder to pair them off with guest characters to immerse them in local goings-on. The advantage is that there’s more interactions among the regular cast, which I personally miss when they spend most of the story separated. As a trivia note, I’ve been waiting for a Big Finish audio to pick up on historical Mesmerism. It’s a minor detail in this story, but I’m pleased. Continuity: This audio slots neatly between The Visitation, which starts with Tegan wanting to reach Heathrow and the sonic screwdriver in working order, and Black Orchid, when Tegan reminds the Doctor she said she wanted to stay with the crew. 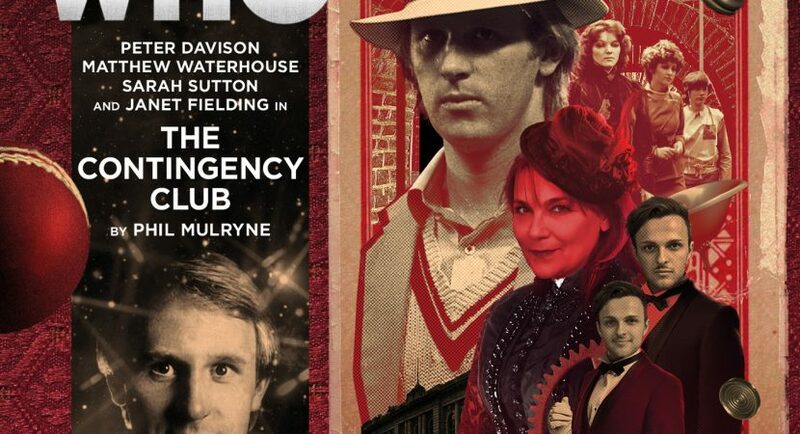 In The Contingency Club, the sonic screwdriver is no more, the Doctor is still trying to reach Heathrow, and Nyssa says Tegan is thinking about staying aboard the TARDIS. (But Tegan’s waffling; an argument with Adric is enough to make her want to leave again).